The Nine: Story Plans Revealed & a Possible Return? The dramatic series The Nine, about a group of bank hold-up hostages, was pulled after just seven episodes on ABC in November due to low ratings. Reportedly six other episodes were shot but left unaired. ABC Entertainment President Stephen McPhearson was reportedly a big fan of the show and the network maintained that the series would return. As recent as last week, that was reinforced when McPhearson told Media Village’s editor Jacki Garfinkel, “I love the show, but honestly we don’t have a set game plan right now.” We now have some additional information. At the annual Television Critics Association (TCA) tour in Pasadena, McPhearson addressed questions from critics about The Nine. He told the audience that the network may air the remaining six episodes sometime in this season — likely before May. Unfortunately, the show is almost certainly cancelled; production has been completed and no further episodes have been ordered. In a lunch with writer Joel Keller, McPherson shared what additional seasons would have held for the drama. The story plan was to reveal the mysteries of the robbery by the end of the first season of 22 episodes. Then, the ramifications of the robbery on the characters would continue to be examined in the following season(s). 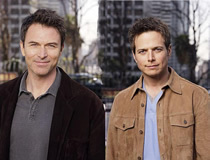 The series was reportedly based on a real case involving a couple on their first date. The two were attacked and robbed and the experience made such a strong bond between them that they later married. McPhearson also shared that, though the ratings were a disappointment, they wouldn’t have done anything differently on series like The Nine. “The shows were incredibly well-produced. We loved the shows creatively. I don’t look back in kind of hindsight and say, ‘Boy, we should have done this differently, that differently,’ about those shows — may have just been timing.” Except perhaps a show’s title. McPhearson also said he believed that part of the reason why The Nine didn’t premiere stronger was the show’s name. It was originally supposed to be called “Nine Lives,” which he thinks would have suited the storyline better. “The Nine” presumably made the show seem too ambiguous to viewers. It was hinted that perhaps ABC may work with The Nine creators Hank and K.J. Steinberg to offer fans some additional information on what might have been. That could include releasing synopses of the four scripts that were ordered back in late October 2006 but were never shot (in a similar vein to what CBS gave Smith fans). Hopefully ABC will get around to airing the final six episodes soon — and stop holding fans hostage. We’ll keep you posted on any new developments so stay tuned! UPDATE: On February 28, 2007, MediaVillage reported that an ABC source shared privately that The Nine has indeed been cancelled. That was a great show, it may have not too much action but sure it kept me at the edge of my seat. i can’t really understand why the low rating, ’cause one of the best programs I’ve seen in years. I loved The Nine from the very start, all the characters were engaging and made me want to get to know them better. I kept looking for the show each week and was so very disappointed to learn that it was cancelled. i want it back!!! ABC plays two new shows that the fans have been hoping for and then pulls the plug once again? Looks like the next several weeks have something else lined up instead of The Nine. What a shame…this was truly a great drama that kept you coming back each week…(even in August!) Why wouldn’t they air all six remaining shows at the very least? Very disappointing ABC!!! PLEASE tell me what to do & who to contact to start a petition to save “The Nine” & continue it on past the 13 episodes that were the only ones filmed. Does anyone know? This show is AWESOME & I want to see it continue! I am SERIOUS about this!! The Nine is being aired now in Europe (Belgium) and we had been told beforehand that it had been pulled off during first season. Knowing that, was it worth starting to watch it? Definitely YES! Last three episodes will be aired tomorrow and I already know I will feel as frustrated as many other fans. The idea to make a mini-series sounds great. Why not use it? How could people in America not watch this show!! I love it and was chocked when I learned that it’d been cancelled. As far as I know we won’t even get all the answers in the 13 episodes. I would have hoped for another season. What was ABC thinking? I loved this show. I was so anxious to know what happened in the bank. What a low blow to viewers to dump the show. Why not put the remaining episodes on during the slow summer months? What do you have to lose? We gambled with ABC why not gamble with us? The nine was the best of all the new shows last season and ABC as it has so many times, blew it off without even trying a new timeslot, or better promotion. I’m sooo tired of starting to watch new series and have them cancelled right away that I’m afraid to start new shows anymore. The cancellation of the nine was the tv blunder of the year! BRING THE NINE BACK!! PLEEEEEEASE!! I suggest ABC return The Nine to its primetime format. It is an excellent show that I watched every week. Some of the remaining shows are worthless by comparison. The Nine was the closest tv could ever get to a movie. I was sucked in on the first episode and immediately set my DVR to tape every future episode. Such a disappointment that its been cancelled.